The summer transfer window is still just about open, and Grosvenorsport.com have pulled off a star signing of their own – England and West Ham legend Sir Geoff Hurst, who has been enlisted by the online bookmaker to help launch Grosvenor Goals for the 2018/19 season. 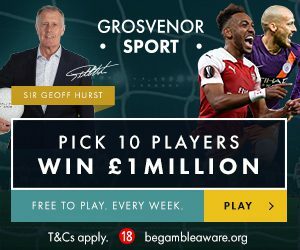 Hurst, who famously scored a hat-trick in the 1966 World Cup final, will be providing weekly picks, blogs, and other content as a brand ambassador for Grosvenor Goals, which gives users the chance to win £1 million, if their 10 chosen players are all first goalscorers in a given gameweek. The free-to-play game, which will be running throughout the 2018/19 season, will also offer £10k for anyone who predicts 10 anytime goalscorers from their selections, with a £10 free bet to those who successfully pick three or more first scorers each week. Sir Geoff will play his part too – if he selects four or more first goalscorers in a gameweek, all users who play Grosvenor Goals that week will win a £10 free bet. Steve Munns, Head of Sport at Grosvenorsport.com, said: “As one of England’s greatest ever goalscorers, we’re delighted to announce the signing of Sir Geoff Hurst as a brand ambassador for Grosvenor Goals. “Sir Geoff certainly knew where the back of the net was as a player – and let’s hope he’s just as shrewd when picking which players will score each week. 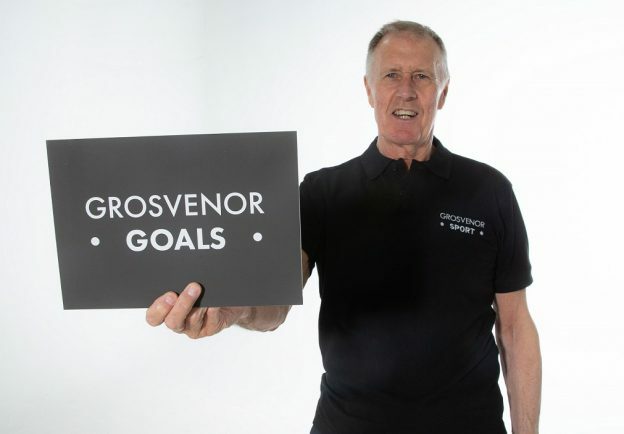 Sir Geoff Hurst, said: “I’m delighted to front Grosvenorsport.com’s Grosvenor Goals campaign, where I’ll be putting my goalscoring knowledge to the test each week.